The Academy Award winner Anna Magnani once told her make-up artist: “Please don’t retouch my wrinkles. It took me my life to grow them.” [F1] Somewhat swimming against the tide, she valued the outward manifestations of her ageing body. Wrinkles and facial expressions testify to the years of interactions of a person with the outside. They map the four-dimensional space of a body and a soul growing old while navigating the world onto a two-dimensional surface. And the surfaces of the planets—their faces, as in “face of the Moon”—similarly testify to their history, their diversity reflecting each object’s formation and subsequent evolution. The inner solar system has the wondrously beautiful Earth, her young surface made continuously anew by plate tectonics and erosion. Mars, whose surface may have once harbored benign conditions for life to develop [e.g., 1], now looks like an inhospitable, dusty place. Venus, in principle Earth’s twin, in practice her evil sister with hell on her surface—462 degree Celsius (863 F) and the pressure that you find if you dive straight down for almost a full kilometer in one of Earth’s oceans. Then there is Mercury, the smallest and most elusive planet, orbiting close to the Sun, always hiding in its glare and difficult to observe from Earth. In the seventies, Mariner 10 was the first spacecraft to send back high-resolution images of Mercury. What scientists saw in those pictures reminded them of our Moon, a rocky world without any substantial atmosphere, its barren surface a profusion of craters and volcanic deposits. Which is which? Left: South pole of Mercury from the Mariner 10 spacecraft. Right: Far side of the Moon from Apollo 16. Sizes are not to scale. These pictures were taken only about two years apart in the seventies. Despite the limited amount of data—Mariner 10 only made three flybys of Mercury during its operations—those data were a surprise. The superficial similarity between the Moon and Mercury—they both looked completely dead with no signs of geological activity in the recent past—was misleading. The most unexpected finding was the detection, by the magnetometer onboard Mariner 10, of a planetary-scale magnetic field. Was the magnetic field the result of organized motions in the liquid core of the planet, as in the case of Earth’s magnetic field? Or was it just a crustal field, as is the case for Mars, where the observed surface magnetization is interpreted as the record of an ancient internal field that is not active anymore? These questions could not be settled. Mariner 10 only imaged 45% of the surface, which was not necessarily representative of the entire planet. 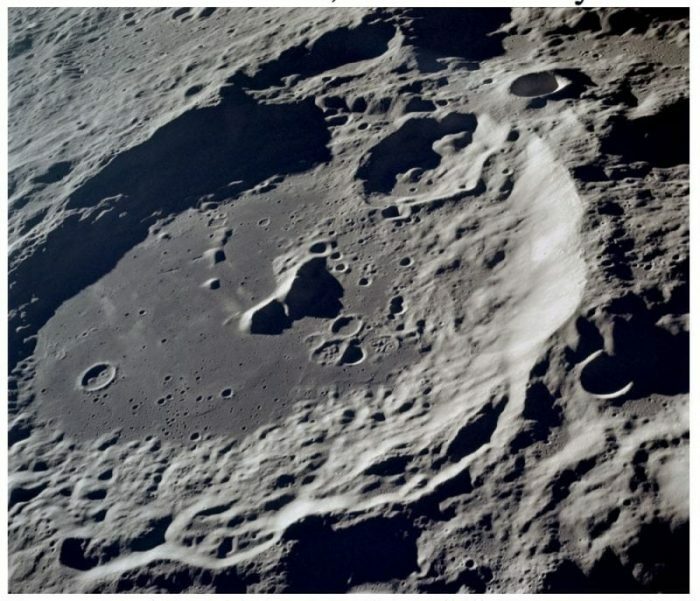 The lunar near side is quite different from the lunar far side, and to explain this dichotomy a combination of processes have been proposed, including impacts, accretion of a companion moon, and local variations in composition [2, 3]. Similarly, the northern hemisphere of Mars is completely different from the southern hemisphere, a discovery currently explained in terms of a giant impact . 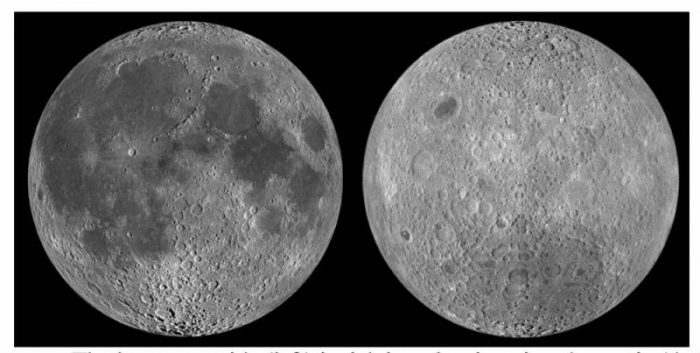 Lunar dichotomy: The lunar near side (left) is rich in volcanic units, aka maria (dark), which are almost completely missing on the far side (right). Credit: NASA LRO. Mars dichotomy: there is a clear difference in the elevation of the northern and southern hemisphere. Credit: NASA MGS. It was clear that Mercury had to be further investigated, and NASA sent the dedicated MErcury Surface, Space ENvironment, GEochemistry, and Ranging (MESSENGER) mission, which continuously orbited the planet between 2011 and 2015. 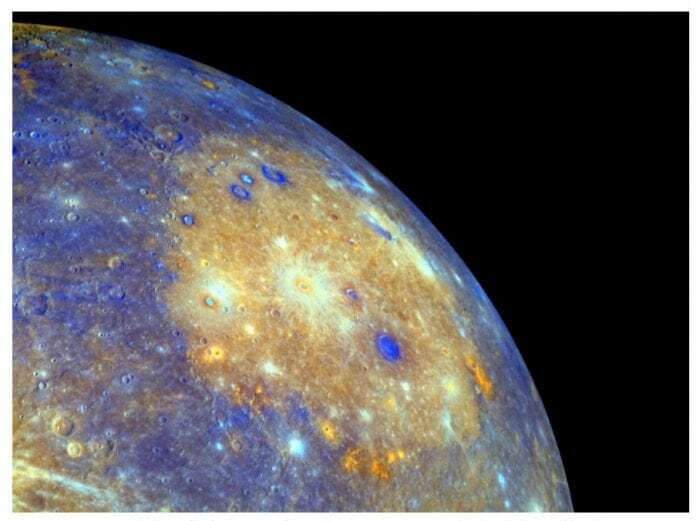 Beyond revealing new and unexpected aspects of Mercury (see the missions’ website for a list of the main findings [F2]), MESSENGER proved even more that the similarity of Mercury with the Moon is misleading. Despite their similar appearance, the surface of Mercury turned out to be younger than the lunar surface. Estimates for the age of solid planetary surfaces are based on crater counting, a technique that allows one to connect the number of craters seen on a given portion of a surface (unit) with its age. The basic idea is that the older a unit, the larger the number of impacts that have hit it over time. Craters as an age indicator. A portion of the surface of Mercury showing the interior of the young Caloris basin (Younger), and an older unit to the south. In the picture, North is to the right. Credit: NASA MESSENGER. The oldest units on Mercury are 4.1 billions of years old (Gyr), while the oldest lunar terrains are about 4.4 Gyr old , and the solar system itself is about 4.5 Gyr old. 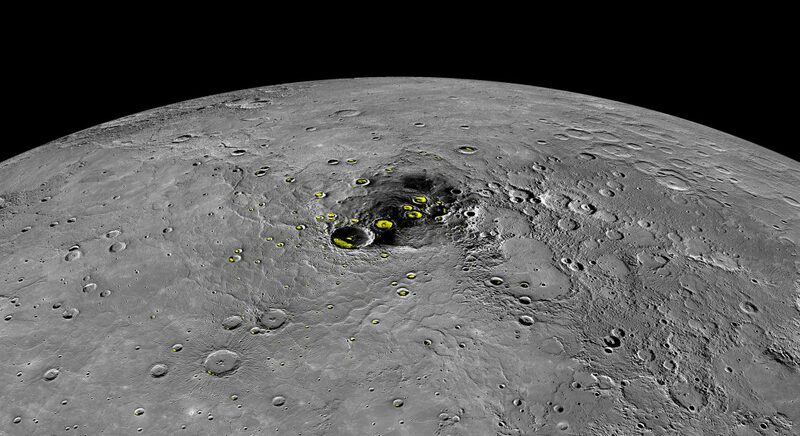 The surface of Mercury, in other words, shows no signs of its first 400 millions of years (Myr) of history. Both massive volcanic eruptions and the formation of large impact basins can reset the age of a unit by covering and/or erasing the record of previous epochs. A good example illustrating this process is Caloris, a 1550-km-wide impact basin (963 miles), which is one of the largest in the Solar System. The basin itself formed about 3.7 Gyr ago following a huge impact that locally removed and melted the crust. The interior of the basin contains a volcanic melt sheet (i.e., a layer of frozen lava) that is younger than the basin itself by about 100 to 200 Myr. Thus, after the basin formed, melt erupted at the surface and filled the basin. Similar processes occurred on the Moon, as illustrated by the Aitken crater. Aitken crater, Moon. A 135-km wide crater, which well illustrates the difference between the crater rim (older) and the smoother (younger) interior volcanic material. Credit: Apollo 17. Very large impact events as the one that produced Caloris deposit an amount of energy in the subsurface that is able to modify mantle convection, the slow flow of hot rocks taking place in the deep interior of the terrestrial planets [e.g., 6]. 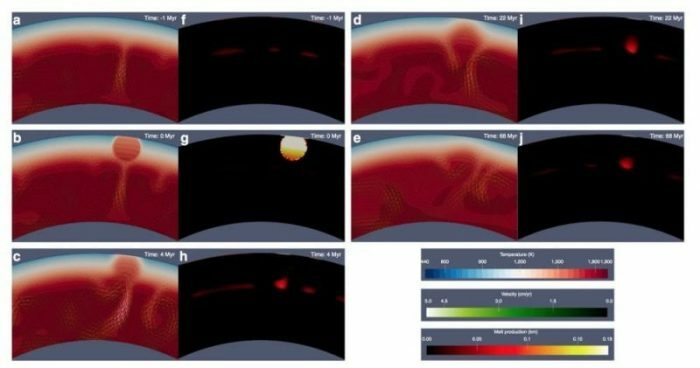 Numerical models of the impact-induced modification of mantle convection show that large impacts locally enhance convective motions and modify both the volume and the location of the associated melt production . The figure below illustrates these effects in the mantle of Mercury following an impact forming a Caloris-sized basin. Forming Caloris. Temperature (blue-red) and velocity (arrows) fields (a—e) and melt production (red-yellow) (f—j) from a numerical model of the convection in the mantle of Mercury. Following an impact forming a Caloris-sized basin (panels b and g) melt production is enhanced and its spatial location modified. From . By keeping track of the amount of melt produced as a function of time under the newly formed Caloris basin, and by comparing the results with the observed volume and time of emplacement of the interior melt sheet, it is possible to connect the observed properties of the interior of Caloris (and, it turns out, of other large basins on Mercury like Rembrandt) with the dynamics in the interior of the planet. The results show that at the time of the formation of Caloris and Rembrandt the mantle was cooling down and producing only small amounts of convective melt . This conclusion is consistent with the dating of the last large volcanic eruptions on the surface of Mercury, which provides an independent handle on the magmatic activity of the planet . The surface of Mercury has a large compositional variability. In particular, the composition of the interior of Caloris has a unique mineralogy that is difficult to explain . The picture above shows how the impact induces melting at shallower depths with respect to convective melting—compare panel i with panel f. These depths correspond to the so-called stagnant lid, which is the uppermost part of the mantle that does not participate in convection (it roughly corresponds to the blue and white region of the temperature field in panels a to i). Its composition likely preserves the signature of the building blocks that formed the planet, and large impacts thus provide a way of making this signature visible at the surface . Caloris basin, Mercury. In this false-color image, which highlights compositional variations across the surface of Mercury, the Caloris basin stands out as a large circular yellow-orange feature. Credit: NASA MESSENGER. The melt sheets observed in large basins serve as probes of the thermal state of the planet at the time of the basins’ formation and their composition potentially provides clues on the building blocks of the solar system. Thus, the ancient surfaces of Mercury and the Moon are mirrors where the history of the planets, and thus of our Earth, is reflected. There’s beauty in ageing, because old surfaces—as old people—have a lot of information to share. Jutzi, M. and Asphaug E., Nature 476, 69—72, 2011. doi: 10.1038/nature10289. Andrews-Hanna J. C. et al., Nature 453, 1212—1215, 2008. doi: 10.1038/nature07011. Marchi S. et al., Nature 499, 59—61, 2013. doi: 10.1038/nature12280. The origin of the quote seems to be an interview the actress gave to the Italian magazine “Panorama”. Several versions exist on the web, whose meaning is pretty much consistent with what is reported here. The ten most important scientific discoveries are listed in the dedicated MESSENGER website. These findings are a compilation of work that was led by Sebastiano Padovan from the German Aerospace Center. Sebastiano Padovan is a postdoctoral scholar at the German Aerospace Center (DLR), Berlin, Germany in the Department of Planetary Physics. His research focuses on geophysics, planetary science, orbital mechanics, astrodynamics, and space exploration.